Socket vs Tanged Chisels - Which is Easier to Use For Fine Joinery? "TANGED OR SHANK CHISELS AND GOUGES. In making up the line of Chisels and Gouges for this catalogue, we have given first place to the Socket Chisels and Gouges, for the reason that this is the style of which most are sold. With our best class of mechanics, however, there has always been a demand for the Tanged form of Chisel and Gouge. Being of course deeply interested in this matter, we have during the past few months made a canvass personally and by letter among a great many of the leading wood workers in all sections of the country, and as a result we find that for the general run of carpentry and building work mechanics prefer the Socket tools, while joiners, cabinet makers, pattern makers and those engaged in the finer class of woodworking prefer the Tanged tools, claiming that they are better balanced, and that they hang better and cut nicer. 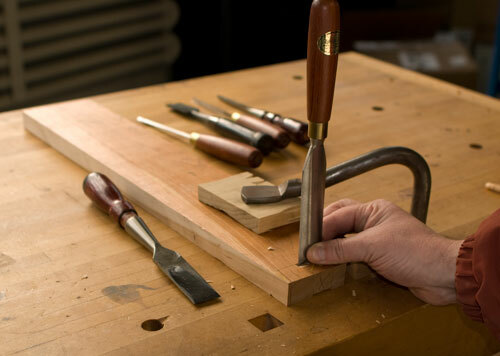 This is especially noticeable in Paring Chisels and Gouges, which have longer blades." Considering that the most popular style of American chisel in the early and mid 20th century were the still prized Stanley 750's it's worth testing this assumption. I trained with Stanley 750's for years and my set has been my go to set of chisels and I have a complete set except for the elusive 1 3/4" size. I've always liked them. I did get a set of Japanese chisels in the 1980's which I liked because they really kept an edge, but they weren't delicate enough for fine joinery. About 6 years ago I bought a set of very very nice decorative Nishiki dovetail chisels which are just wonderful and are my nicest current set - the edge retention and ease of sharpening is amazing. About a year or so ago I got really fond of the Ashley Iles roundback dovetail chisels - which have the same or almost the same edge retention of the finest Japanese chisels I have used - for the same reason - a hand forged and drawn out blade. In any case I decided to compare the Stanley 750 and the Ashley Iles roundbacks. I sharpen to a fairly low bevel angle and both chisels have similar edges. The typical way I and most people use bench chisels is by squeezing the blade between fingers and resting my wrist on the workbench to give maximum control when positioning the chisel. Holding the tool by the handle only makes controlling it harder on delicate cuts. It's funny that when we select chisels we are more likely to just hold the chisel by the handle instead of the way the tool is usually used. But that's another story. The 750 is subtlety more top heavy than the roundback. This makes it slightly easier to feel when the chisel is in a vertical position but it feels a lot like a high spot on a wheel. The lighter roundback seems to give me more control. It feels "smoother" (and smaller - but it's not) but I don't know if that's because of the lower balance, or just its overall daintiness. The difference between the two styles is more pronounced around the 3/4" - 1" size. The more you use a tool the more is should feel like an extension of yourself and control is more important. I'm more interested to being able to subtlety adjust the position of the tool and having the chisel telegraph it's own balance to me is distracting. I want the chisel to do what I want - not be dictated to. So my conclusion is that initially the socketed chisel seems like a good idea but increasingly I like my light, dainty, tanged chisels - I feel more in control even with the lesser vertical feedback. Strelinger was right! But the difference are small and I can also see how both styles are excellent in the hand and once you get used to how each behaves it's possible the advantages and disadvantages of each cancel out. It also occurs to me that the 750 is a fairly short chisel - most of the late 19th century American chisels were long, socketed, millwright's chisels which are certainly far harder to use for fine joinery than a shorter tool - so it's possible Strelinger's advice was more meaningful in the 19th century than it is now. I am not selling my 750's just now so please don't ask. As you say, it is largely an idiosyncratic /whatever-you-are-used-to sort of thing. That said, we all use our chisels for many things beyond chopping dovetail waste. And, frankly, when I chop dovetail waste, I don't even want to get to the baseline while chopping, preferring instead to pare the last bits. For paring and otherwise fine tuning joints (M&T DT, etc), I'm guessing both sorts do fine. There are really many other more pivotal issues in judging a chisel than handle attachment style in my estimation: steel quality in terms of attaining and maintaining an edge; balance; comfort; controlability, and even ease of handle replacement if needed, for example.